So, I’m sitting here staring in anticipation at these boxes of Christmas cards. I say, anticipation because I love writing on, sending and receiving them. The real things. Paper. Not e-cards, although I enjoy do getting those, too. But to me, good old fashioned Christmas cards are the most enduring. I can remember as a child, rushing home from school each day to open the cards that arrived by mail. I’d leave my mama with strict instructions every morning to leave them for me. And, she did. First, I’d check out the envelope to see if my name was included or if it stated Mr. and Mrs. Monroe Turner. Sometimes, an “& family” was added. Most times, especially from close friends, it said, “& Lizzie’. Those were very special to me. It was my invitation into the excitement of a tradition that had been taking place for a very long time. My mama would then save them to look through with daddy when he got home, then she’d string them on ribbon across the mantle. 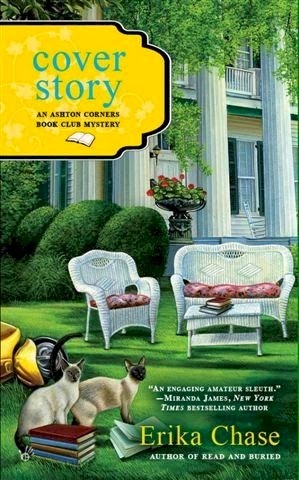 And when that got too full, they’d be draped across our many bookcases in the living room. Of course, I’d get excited about putting up the tree with our tradition of hot chocolate and watching some Christmas TV special right after that. And I’d insist on having The Night Before Christmas read to me over and over again, even though I’d long been reading for myself. Other Christmas memories: sweet aromas of mama’s baking; mouth-watering turkey and stuffing on Christmas Day; and friends stopping by all the time, it seemed. Everyone was in a state of good cheer and best wishes floated through the air. I love Christmas and here it’s about to happen all over again! But first, the cards. Killer Characters are giving away a book a day leading up to the big day! 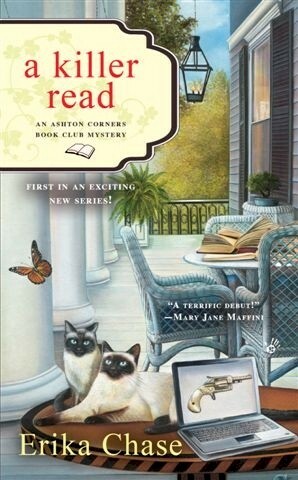 Just be sure to leave a comment and you could win the book of your choice from the Ashton Corners Book Club Mysteries! Happy reading and Merry Christmas! EVery year we love driving around town to look at all the Christmas decorations! Christmas eve service at church, leaving out cookies for Santa, cinnamon rolls for Christmas morning breakfast, being with family...it's a wonderful season. Thank you for the chance to win! Decorating the tree, spending time with family, writing Christmas cards, looking forward to your new book! Since there are no Christmas tree farms near here, when I was growing up, my parents would buy a tree in town and then bring it home and hide it. Somewhere on our many acres. Then on a Saturday before Christmas, we were told it was time to go find our tree. So out we would go and traipse around looking for our tree. Sometimes it took us a while. Meanwhile, Mom would be baking up some delicious goodies for us to enjoy when we got back with the tree. I love Christmas! Sending Christmas cards with handwritten notes. Baking cookies and watching White Christmas. Baking and decorating has always been a favorite tradition. Then comes the company and cooking lots of big meals. My parents always had a real tree and shopping for the perfect tree was great fun. We always decorated it as a family. And, I remember we always drove around town looking at decorations. We went to Midnight Mass and it was so beautiful. Of course, our stockings were hung and my younger sister got up very early to see what Santa had brought us. Great memories. 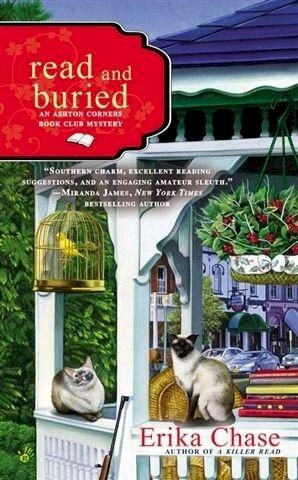 I just love those 2 cats on the cover. Thanks for the contest. We always have oyster stew on Christmas eve---been doing that as long as I can remember. My mother's Christmas dishes have been passed on to my middle son and family but I have a few of my own that signal the beginning of Christmas when I get them out. Brings back many memories from the 40s to now. Getting my Santa collection out and seeing them again (it's like they're new as I've forgotten some of them), decorating the front of the house, and putting up the tree. Don't seem like there are many greeting cards being sent out anymore. Cookies-lots of cookies! We have a Nativity set that a college friend made for us nearly 40 years ago that we still use. When the kids were small the shepherds and wise men moved through the house during Advent and only arrived at the manger on Christmas Eve. Now our granddaughter does that moving for us-though weekly versus daily that the kids did. Thanks for the opportunity to win a book! I always remember that our stockings were long, long, long support hose (!) and filled toe-to-top with fruit and nuts and candy and Cracker Jack and animal crackers and little gifts. And for some reason, after he had delivered our gifts at midnight, Santa came back and left the stockings before we woke again in the morning. Good memories! I love sending and receiving "real" Christmas cards too! One tradition I started is a drive to a special candy shop for handmade ribbon candy! Also getting the real Christmas tree. Tomorrow I'm going to a friend's house and we're baking Christmas cookies-we started that tradition last year! We don't celebrate Christmas so our tradition is going out for Chinese food. The best Christmas/Holiday cards have a personal note. My favorite tradition is baking,decorating and sharing Christmas cookies with my daughter and giving them as gifts to family and friends! (Those that I can keep my hands off that is!) Being together with our families and sharing the true meaning of Christmas of course, is a priceless tradition...<3 Thank you So much for the giveaway!! One of my favorite traditions is making cookies on Christmas Eve for Santa. Not to sound greedy, but I love exchanging presents best. Stacks and stacks of boxes. I like going to Christmas Eve service at the church with candles and carols. One tradition is sending Christmas cards (and letters). I wish I had more people to send them to! Christmas tree time of course! Plus since my family is multi religious we do ChrismaChanaYule traditions of all kinds, lots of cooking and baking, big shared meals, community outreach & volunteering, lots of hot beverages, and of course all my holiday wear! Growing up, one of the Christmas traditions we had was that my brother and I would decorate the tree while watching a VHS of Christmas TV specials (Frosty the Snowman, Rudolph the Red-Nosed Reindeer, He-Man and She-ra Christmas). We always did this the day after Thanksgiving. Even though we no longer live together, we both still decorate on the day after Thanksgiving. Watching Mr. Magoo's Christmas Carol with the nieces. Putting up the tree and decorating the house. I love everything about this wonderful time of year. Sadly, I notice a decrease in the number of Christmas cards I receive every year. One of the things I really love is reading Christmas stories to my kids and doing our bedtime songs and prayers in the glow of the Christmas tree. Such a lovely and peaceful time together. My favorite tradition growing up was Christmas Eve at my grandparents' house with all of my aunts and uncles and cousins. We would read the Christmas Story aloud and sing carols before opening gifts. I used to love taping the Christmas cards we would get all around the doorframe of our entryway. I lived on a working Christmas tree farm so of ccourse decorating the tre was (and still is) my favorite Christmas tradition though! One of our Hanukkah Traditions was a revamp of the 8 nights of gifts. On the first night, mom and dad gave to the 3 kids, then each of the kids had a night to give (not get), then the grandparents had a night. That is 5 nights. For the last three, each child picked a charity and we donated to whatever they selected: the food pantry, mitten tree, toy drive, whatever. Opening presents Christmas morning and then going to spend the day at my aunt's house. She made great Christmas cookies. I love decorating all over. My home, place of work and my daughters. Even other family members if I ncan gwet to there homes. Since family is scattered among several states, tradition has been replaced with adding something new. This year I'm celebrating with a friend and her relatives.